#ozcschat is a monthly twitter chat on Australian Computing Studies education, focusing on the teaching of computing courses. Anyone is welcome to join in on the second Tuesday of each month at 8pm AEDT. Chats are moderated by @sailpip. If you are interesting in being a guest moderator, or would like to suggest a topic please DM @sailpip. The new K-10 Australian Curriculum: Technologies has been endorsed in NSW. It will take a while for a NSW syllabuses to be written and implemented into schools, but as was stated by the BOSTES Inspector (Technology Education), Peter Thompson at a recent ICTENSW workshop, you don’t have to wait, you can start teaching it now within the current syllabuses. The chat will be co-hosted by @LeanneCameron ICTENSW president. What are you excited about with the new K-10 Technologies curriculum? What are your concerns about the new K-10 Technologies curriculum? STEM is everywhere. What ideas/project/concepts do you think students need to be learning in the future? There is a 400% increase in technology references across all new syllabuses. What examples do you have of cross-curriculum projects that support this integration. With technology set to increase exponentially. How do you see this affecting how and what we teach? How do you make technology real for students? What are the challenges in preparing and delivering student reports? What do you include on your school reports? Syllabus content & outcomes, learning profiles, grades, marks? What do you report against? 21C capabilities framework, Australian Curriculum achievement standards? What evidence do you collect and hold on student progress? Do you give real-time feedback to parents? What and how? What parts of reports are worthwhile? What should they contain that they don’t currently? What is digital citizenship? How does it differ to digital literacy? What skills and knowledge do students need to be a digital citizen? What are your favourite resources to teach digital citzenship? How do you upskill teachers/parents to improve teaching/awareness of digital citizenship? Microcomputers and development boards such as Raspberry Pi’s, Arduino’s and Intel Galileo’s are becoming increasingly popular. They allow users to combine gadgets (such as LED’s, fans, motors, sensors), software and coding to create very cool projects that integrate learning in a variety of subjects including science, technology, engineering, art and maths (STEAM). They also provide a context for authentic learning and real world processes and problem solving. Apart from that, they can be a lot of fun, engaging and really addictive! 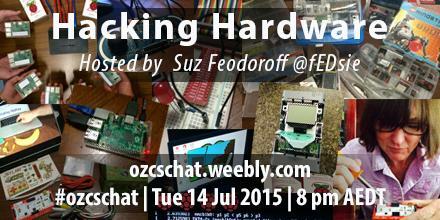 Q1: How do you get started with hardware hacking - what equipment and skills do you need? Q2: What student tasks, projects and hardware have you explored and in which subjects? Q3: How do you engage all students (including girls) and integrate across other subject areas? Q4: What are some of the educational (or other) benefits for students? Q5: What competitions, challenges, camps, etc. are available for students? Q6: What professional learning courses, resources, groups or people can you recommend? "Why is coding and computational thinking is necessary in the earliest years of schooling?" Q1: What is coding and computational thinking? How do they relate? Q2: What are your goto resources to start coding? Q3: Is coding the new literacy? What place should it take in the curriculum? Q4: In an ideal environment, what do you think coding would look like in primary schools? What are students doing? Q5: How can we support all Ts in teaching computational thinking as part of the national Technologies curriculum? Q6: What would you say to Tony Abbott about teaching coding to children in the early years? IT subjects and skills are often overlooked. We need to make sure that our students are well supported in these subjects. Nick Patsianas is currently in Year 12. He has grown up watching IT subjects become more and more popular. When he was younger he thought it was weird that he liked to take apart computers and play with technology. Recently he attended the #ICTENSW conference and saw so many students present so passionately about IT related topics and skills. Being interested in IT things may have been weird back then but they’re definitely not weird today, but how well are they supported? What are some challenges that IT subjects and students are facing today? How can we connect students to experts, industry or both? Any great excursions? How can student IT work be shared with an audience beyond the school walls? How can we engage and utilise “Geeks” in your classroom and school community? How can we make IT students shine, like our sporting stars? How can we engage parents with IT subjects? What's IT got to do with Education? The questions relate to topics, presentations and workshops that will be at the conference. 1. What are your thoughts/experiences of Maker Spaces? 2. What IT competitions/challenges/clubs/excursions have you been involved in? What are the benefits? 3. Which of the following will have the biggest impact on education 3D printing, Raspberry pi, robotics, augmented reality, QR codes? 4. What IT tools do you find essential for learning? Why? 5. What are the challenges/successes of BYOD/BYOT? Topic "What IT is ahead in 2015?" 1: What (new) IT subjects/topic/skills are you teaching this year? 2. What personal computer learning goals do you have for 2015? 3. What IT (projects) are you looking forward to teaching/learning in 2015? 5. What IT tools, software or apps will take off in 2015? 6. Name an IT person that you would love to work with and why?